The mule deer has large ears (like those of a mule) and tan to reddish brown fur in summer, grayish brown in winter with a white rump patch and a narrow black-tipped tail. It holds its tail down when it runs, unlike its cousin the white-tailed deer. Antlers, found only on bucks, are bones that begin growing in late winter and will reach full growth by late summer. Developing antlers are covered with a skin-like “velvet” which supplies blood and nutrients to the developing bone. The velvet is shed by early fall and the antlers harden and get somewhat shiny. The antlers have a main trunk that splits into two branches. Each branch or tine (point) is approximately the same length. Typical four point antlers have secondary forks that arise from these branches. Antlers are shed yearly, usually by late December and the growth cycle begins again. Mule Deer move between various zones from the forest edges at higher elevations to the desert floor, depending on the season. Generally, they summer at higher elevations and winter at lower elevations, following the snow line. Mule deer occupy almost all types of habitat within thier range, yet they seems to prefer arid, open areas and rocky hillsides. Areas with bitterbrush and sagebrush provide common habitat. Mature bucks tend to prefer rocky ridges for bedding grounds, while the doe and fawn is more likely to bed down in the open. Throughout the entire western United States, including the four deserts of the American Southwest. From the coastal islands of Alaska down the Pacific Coast of California to southern Baja Mexico and from the extreme northern portion of the Mexican state of Zacatecas, up through the Great Plains to the Canadian provinces of Saskatchewan, Alberta, British Colomobia and the southern Yukon Territory. Seasonal movements from higher elevations to lower winter ranges are affected by food supply and ability to move due to temperature and rain or snow conditions. When startled, a mule deer will move in a series of stiff-legged jumps, called “stotting,” with all four feet hitting the ground together. This gait offers two advantages: it allows the deer to out-distance predators in rough terrain, and to see above the thick brush. If necessary, they can turn or completely reverse direction in the course of a single bound. Mule deer tend to bed down in a cool, secluded places in the middle of the day. They are most active in mornings, evenings and moonlit nights, enabling them to conserve water and keep body temperatures down in desert environments. 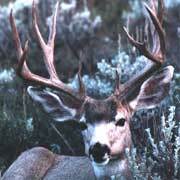 Mule deer are herbivores and are considered browsers. They are nocturnal feeders and are most often seen in the early morning and late evening. What they eat depends on their habitat, however common food includes forbes or weeds and woody browse like sagebrush and bitterbrush. When available, they will also eat fruits or nuts like cactus fruit and acorns. Mule deer have a four-chambered stomach and will re-chew partically digested food when resting. This allows deer to digest fiborous leaves and twigs. Mule deer get their water from streams, puddles, rain, snow, dew, or absorb water from eaten food. Breeding season, or the rut, occurs in November to December. A buck will find a suitable doe and they will often play chase games at breakneck speeds before mating. They will remain together for several days. Single or twin fawns are born in May to August after a seven month gestation period. Females will reproduce most successfully when they are 2.5 years of age. Nevada protected, big game mammal, meaning it can be hunted in Nevada during the specified season, and by allocated tag only. Traditionally hunted big game species. The biggest threat to mule deer is loss of habitat due to drought, fire, habitat fragmentation, lower quality habitat, and other factors. 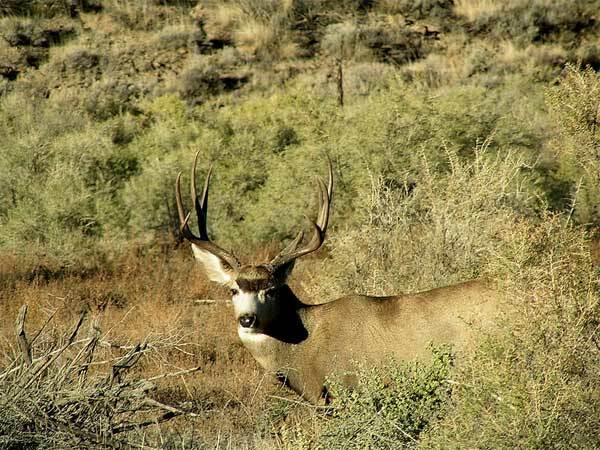 Drought causes malnutrition and lower reproduction throughout deer range. Loss of winter range to housing development or losses due to disease are also common. Mountain lion, and coyote are predators of deer in Nevada. The Nevada Department of Wildlife manages consistently surveys deer populations throughout the state and makes harvest recommendations to the Nevada Wildlife Commission for the yearly seasons and regulations. Mule deer are good swimmers, though they rarely use water as a means of escaping predators. Antler growth in is initiated and controlled by changes in day length acting on several cell types of the anterior pituitary. While unable to detect motionless objects, mule deer are very sensitive to moving objects and their sense of hearing is very acute. Cast off antlers provide an important source of calcium and other minerals to wildlife such as mice, porcupines, coyotes, bison, elk, and deer, all of which chew on the tips and softer portions throughout the year.